Crafted by hand in Australia, Maritimo is inspired by a lifelong passion for performance, build integrity, and innovative design that withstands the test of time. With a heritage steeped in offshore racing; engineering excellence and reliability are paramount! A fine balance of advanced hull design, generous fuel capacities and precision weight distribution results in a smooth, responsive and effortless driving experience, superior seaworthiness and unrivaled performance. The new Maritimo 54 MY, equipped with a Joystick Docking and “Quick Gyro” stabilization system, features wide walk-around side decks which make handling fenders and dock lines easier and safer. The enlarged cockpit with bi-fold doors accentuates the open concept layout. The aft “Chefs Galley” incorporates Miele appliances and a well-appointed pantry- ideal for easy entertaining whether you are dining inside or al fresco. Walk aft on the flybridge and you will be surprised by the size of the “Juliette” balcony; a large and versatile space for entertaining or relaxing. The Maritimo M51, equipped with Joystick Docking, hits the sweet spot for boaters who are looking for all the facilities and benefits of our larger yachts in a more compact package. 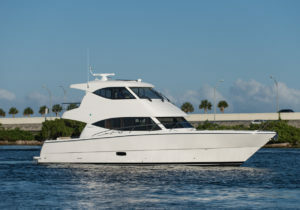 It loses none of the Maritimo hallmarks: the aft bi-fold doors, internal staircase to the enclosed flybridge with the fold-out sofa option, wide walk-around decks, a full-beam master, and an innovative third cabin to starboard that’s optioned as a utility room with washer/dryer. The aft galley is of generous proportions with ample storage, and opens out to the spacious cockpit for alfresco entertaining. The cockpit also boasts an electrically operated hatch giving full and easy access to the lazarette. Influenced by the Australian lifestyle and beautiful coastlines, admire the space and attention to detail, which combine to create the ultimate sanctuary for enjoyment, relaxation and freedom.